Pictures you take during your Vietnam trip to adopt your child or when returning to Vietnam will bring important memories for years to come. What pictures are important to take? Everyone uses their camera phone, which makes it so easy to take photos when you are traveling. Just be sure to puy your phone on airplane mode to avoid unwanted data charges. You might also want to bring a seperate camera as well. While eveyone seems to take photos of food, there are more important events you will want to document on your journey. The most important photos you can take are of your chid. When your child is older, these photos will be extremely important. They document their early existence, in which they will be naturally interested. Children love to see pictures of babies and younger children as well, and nothing is as interesting in pictures of themselves. It will help them put into context the circumstances of adoption and what adopotion means. Their earlier life is a blank, and these photos help to fill that in. In school they will be asked to show early pictures of themselves, and they will be so glad to be able to do this, like everyone else. The second most important pictures to take are any record or interaction you have with their birth parents, and their birth family. These pictures are invaluable. The third most important picture is you holding your child. This underlines the love you have for them. Personally, My favorite picture is of my daughter asleep in my arms. Pictures that show your child interacting with their environment are important, espcially if you have a story that can go along with it. Perhaps their first ice cream, first step, first laugh... Pictures of them important places, for example the orphanage, can also be important visual memories. Important people in their adoption, such as caregivers and adoption workers, guides, and people around Vietnam in the hotel, shops and streets may also be of interest. Places that are important include: the orphanage and/or living situation, hospital, your child's Province, street scenes, places you visit, and a few key buildings or famous places. There are many benefits to photographing your adoption journey – for yourself, your children and for your family. When children are young, they love to watch movies and look at pictures of babies and children, and those of themselves are especially enjoyable. As they grow older they will come to understand more fully what is happening in the tape. It will bring reality to their thoughts and questions about their birth parents and the country and circumstances in which they used to live. While the tapes will probably be watched less often as your children grow, it is likely that they will pull them out once or twice a year to see them. At each stage of development, watching these tapes by themselves or as a family, gives them a chance to revisit their adopting and past, with new eyes and a comfortable sense of familiarity. Adoptees often have a large gap in their past, with no or few memories, few mementoes and often few pieces of information. Thus a tape can be a real blessing by capturing important moments of their past. Pictures of the birth family, their care givers, the orphanage, hospital and town in which they lived will have meaning for them all their lives. In the future, if they or you wish to search or make contact with their birth family, the pictures may prove beneficial. For your family, watching the movies or looking at pictures together can be a time of happy memories. Even if its years apart, can be a special time to bring the family together by remembering fondly a unique, shared experience. Pop some popcorn and make it fun evening event. Your movies can be used as a means of reminding our children how much we wanted them and care for them. Capturing those early days with your child can also be fun, as children change so fast. I recall that just in a few days when we were alone in Ho Chi Minh City, my daughter moved from rolling and crawling to walking, as she became more confident that she was safe and secure. Her first bath when she laughed and played in the tub is a memory I will always keep. It would be wonderful if I have been able to capture it in a movie! Movies and pictures also give you the chance to share this special trip with your extended family members who are unable to travel with you. Older and younger children, grandparents, and perhaps even your marriage partner are likely to be very interested in seeing the place where your child was living. Vietnam is a beautiful country, and as they grow up, children will enjoy seeing what it was like when they lived there. It is changing so fast, that it is likely to be very different by the time they return. Plus, this will provide them with solid memories and images of this wonderful country, which will help their self esteem when they run into negative remarks about being adopted or being Vietnamese. As they grow up and spend some time learning about their culture, and even at times, teaching others about at school, etc. This tape can help form some images in their mind to share with others. Just as with all adoption information, you will want to decide how much of these tapes you wish to share with others. Personally I would treat some as private information for your child, and share them primarily with close family or very close friends. But there is no need to make a big fuss if your child wishes to share them with her friends, you don’t want to create a sense of shame. In fact, just the opposite, your videotapes can shed light on what is for many adoptees a rather mysterious past event. Taking a trip back to see their homeland can be an important part of any international adoptees personal journey. 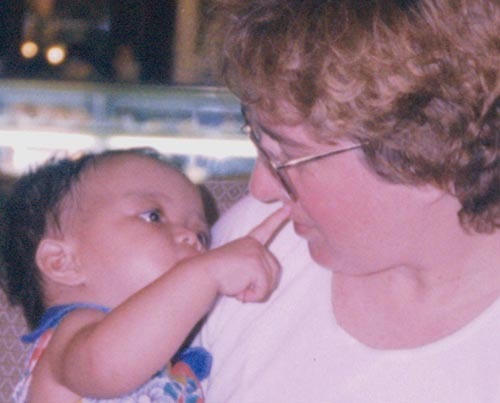 As a parent, it is wonderful to relive the experience of adoption with your child, now older. It is an amazing time! It is especially important to your child, to get to actively engage in the land of their birth. To be one of many who look like them, is often a very novel experience. Documenting this experience in pictures and movies is a wonderful thing to be able to share. Take pictures of each other, and ask people to take pictures of you all together. Most people will be thrilled to do this. I often offer to take pictures of couples or groups when I am traveling and it is always well received, and often reciprocated. Of course, you will want to take photographs of special shared moments. And yes, that will include food! Any fun tours you go on, crossing the street(! ), sights, shopping, and other experiences are fun to document. If you both take pictures and share them, you have double the memories and insight. This sounds great, but what is the negative side to photographing your adoption journey? The main negative point is that cameras and phones can be intrusive and awkward. Most people in Vietnam are not wealthy, and they can be yet one more sign of ostentatious wealth. Since they can be expensive and its contents are valuable to you, it is also a distraction in your concern for safety and possible theft. Plus, you want to be sure to participate in the moment, and not be distracted by "the perfect picture." Carrying the camera with you and taking pictures while also coping with paperwork, complicated transportation arrangement and confusing crowds can be very difficult. Not to mention trying to handle a baby! This is made easier on trips with two people sharing the camera work. Or ask a friend in your adoption group to help you tape. Often adoptive parents will share tapes together of their trip, after they return. One primary concern is that you also do not want to discomfort people in your travels. 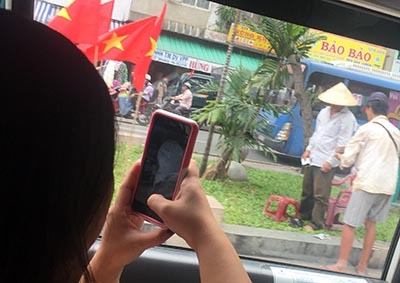 Generally Vietnamese people are shy of the camera, but usually do not object to videotaping. However, this might change as camcorders become more ubiquitous. It is best to be polite as ask ahead of time if you can take a picture. Please take pictures very discretely. Fame is not as positive a virtue in Vietnam as it is in the United States, and even here most people object to overly strenuous camera action! Not all parties to the adoption will want to be taped, either. It is important that the videotaping not become the focus of your attention. Nor should your camera work distract others from the important situation at hand, the adoption of your child. You do not want to intrude on your own adoption experience, or that of the other parents. Nor do you want to show discourtesy to your hosts. During the ceremony or visits to the orphanage and certainly during your meeting with your child and their caregivers, you will want to keep attention on these important people. This is a precious time, and allowing yourself to feel the emotions of the moment is invaluable. If your main memory of the adoption is the camera angle, you are doing yourself and everyone involved a big disservice! Carry extra memory, cords, etc. Consider using one of the newer, small cameras. Keep your camera with you or in a safe place, like the hotel safe. Ask for permission before shooting if it's a personal situation or you will be up close. Do not be intrusive in your shots, take pictures discretely. Do not shoot continuously as if on a tour. Take time to let yourself and others react naturally to what is going on. Share the camera around so you are in some of the pictures. If you are on a tour, you can share pictures after by email. Do not hide behind the camera. Interact with others and refrain from always putting them on stage or putting the camera between yourself and others. Hold your child, not just the camera! Allison Martin is a well regarded webdesigner, writer, biologist and adoptive parent.